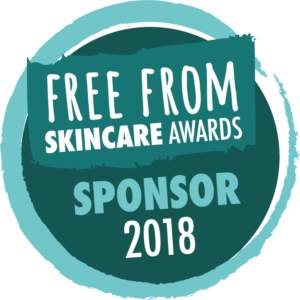 Sponsors are a valued and essential asset to the Free From Skincare Awards — and we’re hugely proud to be associated with every one of our six current sponsors, namely NATorigin, Formula Botanica, Bare & Beyond, Lavera, Organyc and Organii. Should we not be? There seems to be occasional scepticism about the involvement of sponsors in beauty awards on social media, but were it not for the support of our sponsors, our entry fees would have to be raised in order to pay our bills, pay our expenses and pay our several freelance staff. This would perhaps not be a problem for larger brands — but it would almost certainly be for smaller brands, who we have always tried to support and encourage and make the Free From Skincare Awards fully accessible to, given that some other Awards are either prohibitively expensive, request huge numbers of samples to be sent, or expect the participating brands to take out costly advertising packages. I’ve also come across the argument that having sponsors somehow compromises any initiative’s independence. We don’t really see this. Our testing and judging processes — outlined here — are the most thorough and transparent of any Award program we’ve seen, and the 100+ testers we recruit for the initial intensive phase of month-long testing are totally independent skincare and cosmetics users, distributed through the country, who aren’t associated with our Sponsors (nor indeed our entering brands) and may not even know who they are! When it comes to our judges, yes, we do sometimes invite sponsoring brands to participate in judging, and their input into the entries for the categories they are sponsoring can be extremely valuable. Sponsors have been participants too – some have won awards, and some haven’t, which is what would ordinarily be expected, after all. Because most of our other judges are independent, and because we ask them to declare any affiliation we may not know about and ‘step aside’ from any judging which might involve a conflict of interest, the whole process is kept ‘clean’ and ethical. We wouldn’t have it any other way. We think our sponsors have chosen to support us because they believe in our Awards’ integrity and want to support us, the brands entered and most of all the ‘free from’ cosmetics consumer who requires guidance and advice in choosing their skincare products. Our testing and judging processes are thorough, and they are long. That means they can be costly. Without sponsors, we might have to cut corners – fewer testers, reduced testing period – which would make the Awards far less meaningful. What would be the point? Sponsors understand that the world of skincare and beauty is a community, that there are wider benefits to us all in being supportive. We can never stop thanking them for their support, both financial and moral, in our initiative, and hope that our entering brands – especially those smaller start-ups who really benefit from our Sponsors’ involvement – can thank them too! To read more about our Sponsors, click through to their dedicated sponsor pages on our site … NATorigin, Formula Botanica, Bare & Beyond, Lavera, Organyc and Organii. If any brands out there would like to sponsor us and be involved in the Awards and presentation event in July – there are still some categories up for grabs! Find out more here.